The alarm went off this morning around 6:25, and we got out of bed pretty promptly. Dani said that she didn’t sleep particularly well (it was a little warm and very sticky after two days of biking without showers). We broke camp pretty quickly and headed out without breakfast because we knew the town of Cambria was less than three miles away. The town was off the highway and fairly cute. After consulting Yelp, we ended up at Creekside Gardens for breakfast. It was over 25% cheaper than breakfast the day before and I’d say twice as good. It’s amazing what a little competition can do. We sat out on the patio in back and charged our phones. The only downside to this place was that they weren’t providing tap water due to the drought. After breakfast we climbed a hill (large for the day but small/medium for the trip ) and turned back onto Highway 1. The next 15 or 20 miles were pretty unremarkable, except for the lovely tailwind pushing us along. You don’t really notice a tailwind as you’re riding (aside from feeling like you’re really strong and fast), but Dani pointed out the extent to which the grass and trees were swaying in the wind and we were very happy that we weren’t riding north. At least there was shade on this hill. Dani demonstrating her flawless no-look, over the shoulder photo technique. 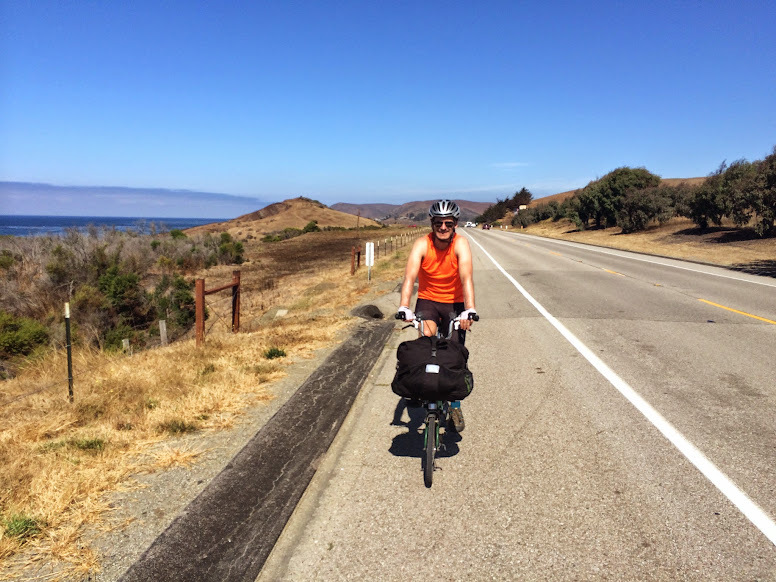 We turned off the main highway to ride through Cayucos. Taking the Business Route 1 through town saved us a big climb on the normal road. After this town, Highway 1 got a lot less pleasant. It turned into four-lane highway, and even though there was a very wide shoulder, it quickly became unfun. This continued through Morrow Bay. 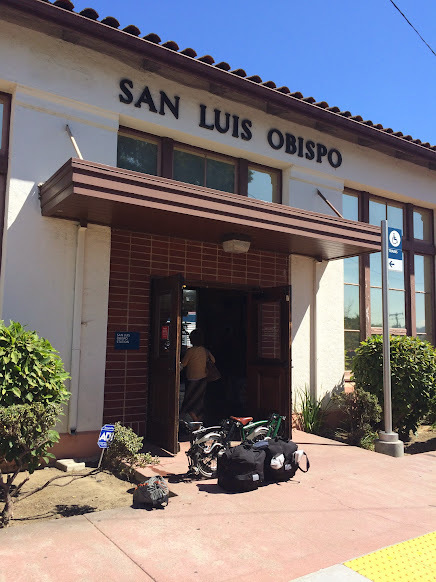 After Morrow Bay, we remembered that Google had suggested an alternate route into San Luis Obispo that was a little bit longer but not on the expressway. Dani did some quick Googling, and led us on a detour on Turri road off of Los Osos Valley Road north of Baywood-Los Osos. This was one of my favorite parts of the trip. Turri road (which is apparently often used for bicycle photoshoots) is a nearly empty road that passes through beautiful farmland. It was the only time on the whole trip we rode on a non-busy road, and it was amazing. The couple of trucks that did pass us slowed down and gave us wonderful amounts of room. We took lots of pictures and a few videos. Oh for an entire tour with this little traffic. Can you see Dani? She’s there! 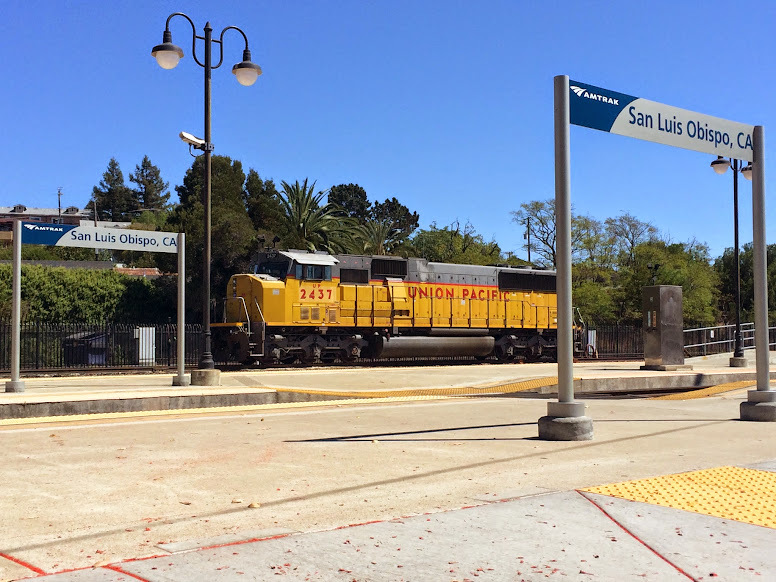 The Turri road detour added six or seven miles onto our trip, but we still made good time to San Luis Obispo. Once we made it into town we heading to the local YMCA, where we paid $20 for a day membership so we could take a shower. 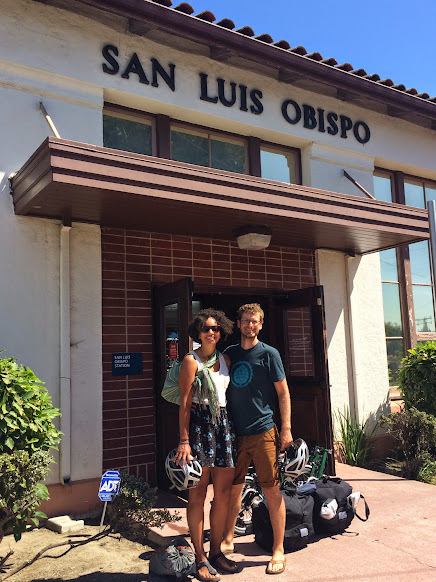 After our shower, we rode to the High Street Market and Deli, where we got some astounding sandwiches, and then continued on to the train station, where we sneaked our folded bikes onto the luggage rack and relaxed on the ride back up to San Jose. Bags and bikes, ready to go.